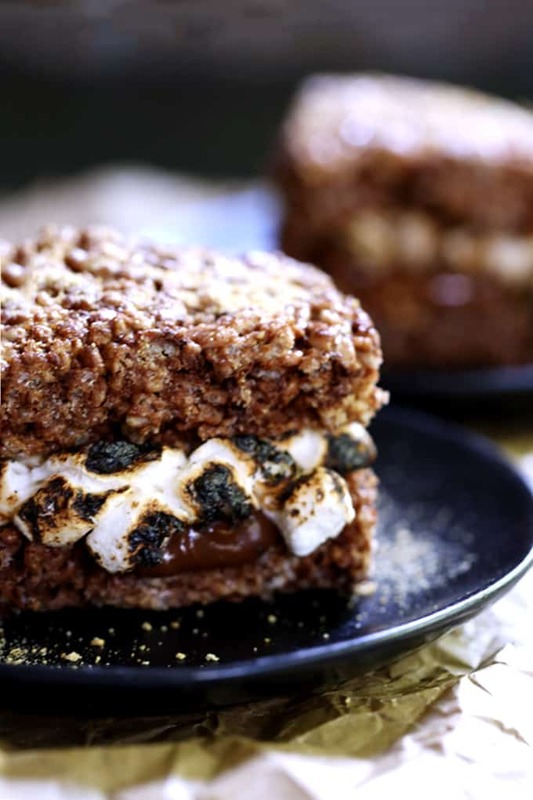 These S’mores Stuffed Chocolate Krispie Treats are the perfect mash-up of two favorite summertime sweets. Thick and chewy chocolate marshmallow treat bars are split in half before being lacquered with chocolate and torched mini marshmallows. 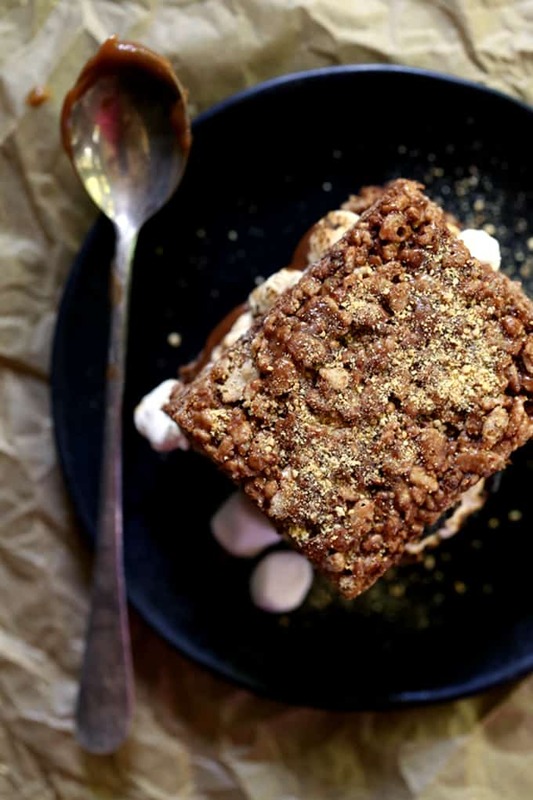 The other half of the Rice Krispies treat is plunked on top and then they’re sprinkled with a shower of graham cracker crumbs to create the ultimate summer dessert sandwich. The first official day of summer. It’s hard to believe it’s already here, yet again, it’s already our third week of summer vacation. That fact is even harder to believe. Likely because my weeks have been filled with packing and trying to tie up all the loose ends involved with moving a family of six across the country. Good times, indeed. In fact, I left a party that was being held to celebrate Andy’s residency completion so that the baby could take a nap (a perk of the party being close to come!) and made these S’mores Stuffed Chocolate Krispie Treats, went back to the party when she woke up and then came back home to photograph them. How’s that for chaotic? But the chorus of oohs and ahhs when I let my little ones sink their teeth into these chocolatey sandwiches more than made up for it! The reason why this amazing treat takes just 20 minutes to create? 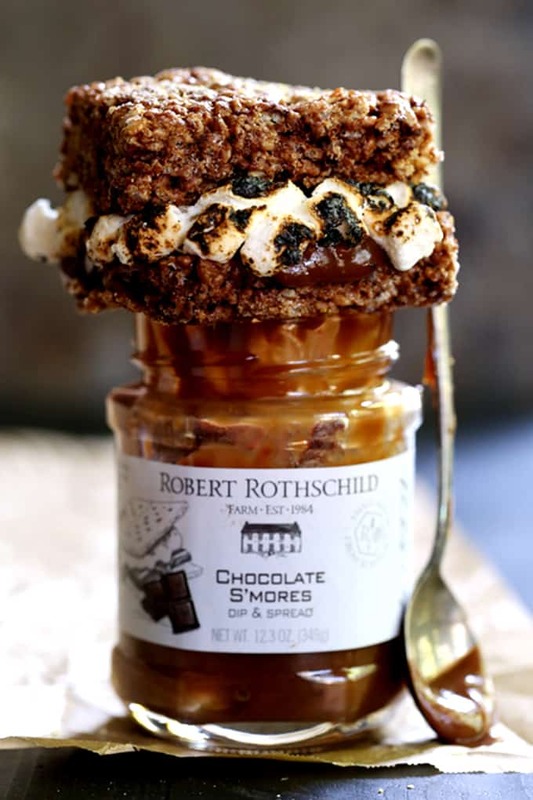 My flavorful shortcut – a jar of Robert Rothschild Farm’s Chocolate S’mores Dip. Inspired by the campfire classic, the flavors of chocolate and marshmallow are combined for a treat the entire family will love. This dip is so delicious that you’ll simply want to grab a spoon and dig in. The thought absolutely crossed my mind more than once. I mean, talk about the perfect way to alleviate all that impending move induced stress! 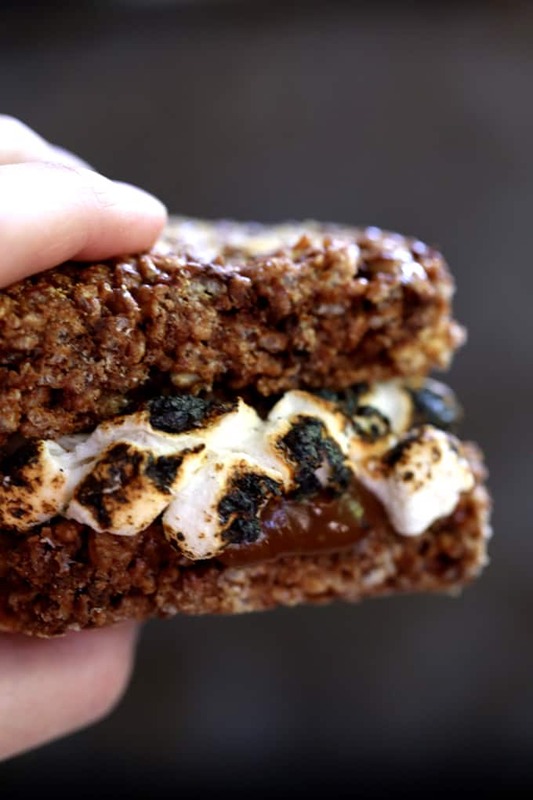 Instead, I used this S’mores Dip to not only flavor the Rice Krispies treat part of this dessert sandwich, but I also used it again for the filling. Isn’t there a saying you can never have too much of a good thing? These S’mores Stuffed Chocolate Krispie Treats are the perfect example! 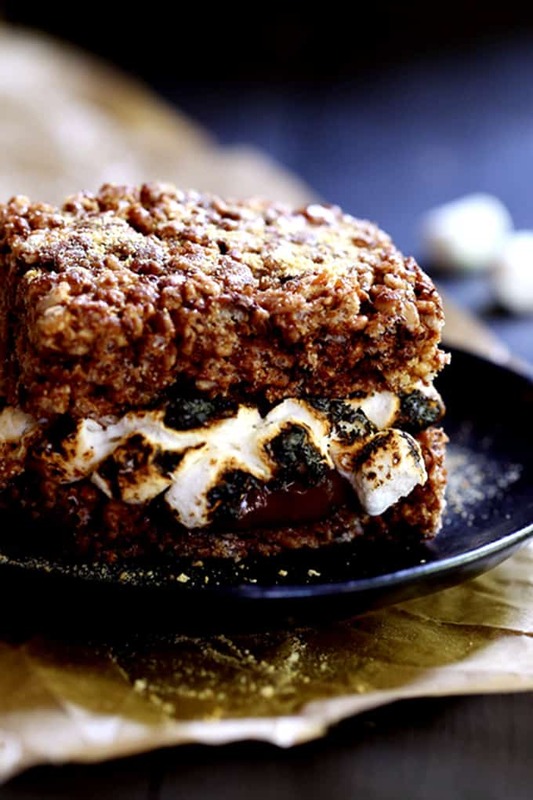 We have a dinner with friends scheduled less than a week after we arrive at our new home and because they’re so easy, I can’t wait to share these S’mores Stuffed Chocolate Rice Krispie Treats with them. I’ll be the summertime dessert hero in no time! In fact, I’ve got an entire s’mores dessert lineup to get me through the rest of the summer. My Cherry Cola S’mores Brownies are a mashup of my favorite soda and super decadent brownies. My Peanut Butter Cup Stuffed S’mores Brownies are just as delicious. My Double Chocolate No Bake S’mores Pie is not only delicious but takes just minutes to prepare. I’ve also got plans to add this sky high S’mores Fudge as well as this gooey Cookie Butter S’mores Dip to my must try list. And seriously, what better way to start my day than with this S’mores Coffee Milkshake. S’mores all the things, I say! In a small saucepan over low heat, add 2/3 cup S'mores dip and heat until warm and bubbling. Add marshmallows to saucepan and stir until melted. Stir in cereal, graham cracker crumbs and chocolate chips. Press mixture into 8"x8" pan and allow to set for two hours. Cut Chocolate Krispie Treats into 9 squares. Cut each square in half lengthwise. Spoon 2 tablespoons S'mores dip onto one side of each cut Chocolate Krispie Treats. Top with a handful of mini marshmallows. Using a kitchen torch, toast marshmallows to desired doneness. Top marshmallows with other side of cut Chocolate Krispie Treats. THIS IS PHENOMENAL! seriously...I'm nearly speechless over this amazingness. I love everything s'mores, forever, always. How fun are these?! Love how you 'lacquered' on all that chocolate! Such a perfect summertime treat! What a delicious dessert! My kids love rice krispies treats, this will be a special one for them! Well, these would make my summer. Childhood food trauma has prevented me from wanting to eat a s'mores ever again, but these are downright temptation to get over my childhood irrational dislikes. Summertime should be called S'more season! You had me at smores! Stop it, these are out of this world! Yummy! HOLY DELICIOUSNESS BATMAN! These look so over the top amazing! Girl, you have totally outdone yourself. If there were an official food of the first day of summer, this should be it! So in love! These look amazing, and I can't wait to find them. I really need a kitchen torch, so I can melt marshmallows, too.. I'll put it on my wish list.